Rath Yatra Odia eGreetings Cards and Scraps Click Here. Puri Rath Yatra 2019 is likely on 4th July. 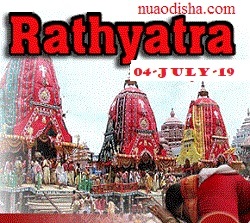 Bahuda Yatra 2019 is likely on 12th July. Ratha Yatra, the grand and colorful festival of chariots, is held on Asadha Sukla Dwitiya i.e. the second day of bright fortnight of Asadha (June-July) every year. Millions of devotees from different parts of the country and abroad witnessed the spectacle of world famous Car festival of Lord Jagannath at Puri. This festival is also known as ‘Gundicha Yatra’ and ‘Ghosha Yatra’. As per the prevailing tradition, Gundicha was the Rani (queen) of Raja Indradyumna, the legendary builder of the first temple. She had initiated this grand festival. Hence, this festival is also known after her name. On this day, the three deities are taken out from the main Temple, placed in three gorgeously decorated chariots and start their journey to Sri Gundicha Temple. The chariots are dragged by thousands of devotees from the Lion’s gate of the Jagannath temple to Sri Gundicha Temple which is located at a distance of 3 kilometers. The 3 kilometers Grand Road , known as ‘Bada Danda’, between Jagannath Temple and Sri Gundicha temple, looked like a sea of as the devotees pumped to have a glimpse of the deities on the chariots. The day of the Rath Yatra in Puri is the only day in the whole year when the non Hindu devotees can have an opportunity to see the gods and goddess of Jagannath temple puri. All for the convenience of devotees, Puri Rath Yatra Festival Tour is largely organized in the country and, every year, tourists from home country or abroad take part in Rath Yatra Tour, with full of zeal. Apart from Indian, this festival attracts a large number of international tourists in Puri. The ISKCON foundation gets the credit for taking this grand celebration to an international level.